Sensors / Transmitters There are 16 products. 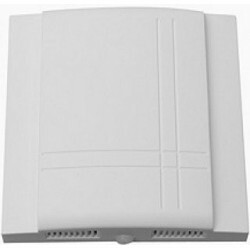 The Vector SRC-H1Tn10-A3 Indoor Wall Mounted Humidity Transmitter with Temperature Sensor has options of 0-10V / 2-10V / 0 - 20mA / 4 -20mA output for humidity configurable by jumpers and a NTC Temperature Probe. 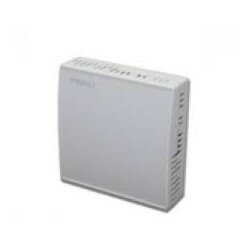 The Vector SRC-C1 Indoor Wall Mounted Co2 Transmitter has an option of 0 - 10V / 2 - 10V / 0 -20mA / 4 -20mA Output with a 0 - 2000ppm Range Can be used a Proportional Fresh Air Controller or Direct Control of an Extract Fan Display module available. 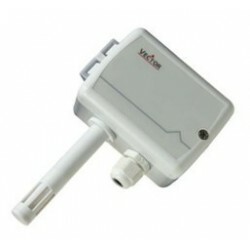 The Vector SOD-Tn10-1 is a Outdoor Temperature with a NTC probe. 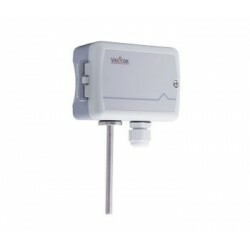 The Vector SOC-T1-1 is an Outdoor Wall mounted Temperature Transmitter with an option of 0-10V / 4 = 20mA Output Configurable via jumpers. The Vector SOC-H1-A3-1 is an Outdoor Wall mounted Humidity Transmitter with an option of 0-10V / 4 = 20mA Output Configurable via jumpers. This transmitter needs to be connected to a controller with a 0-10V input to control humidity as listed in Controllers - Analogue Inputs in the Category menu. 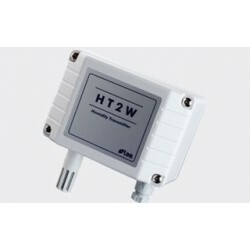 The LAE Universal Wall Mounted Humidity Sensor HT2WAD with 0-10V Output This sensor needs to be connected to controller with a 0-10V input as listed in Controllers - Analogue Inputs in the Category menu. 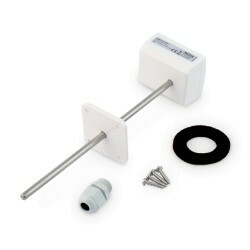 EVCO Humidity Sensor EVHP503, 4-20mA Output, Wall clip mounted. This sensor needs to be connected to a controller with a 4-20ma input as below. EVCO EVTPN615F200 NTC Temperature Probe, thermoplastic lead, 6 x 15mm overmoulded tip. 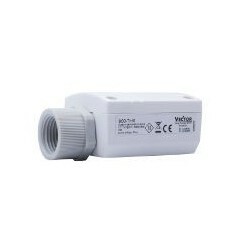 Range -40 to 110 Deg C Suitable for all EVCO NTC Controllers. 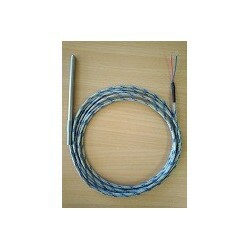 EVCO EVTPJ815V200 J Type Thermocouple, 1.5m Steel Braded Lead, 6 x 100mm Stainless Steel tip. Range 0 to 350 Deg C Suitable for most J Type Controllers. 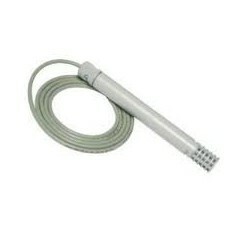 EVCO EVTPJ830V200 J Type Thermocouple, 3m Steel Braded Lead, 6 x 100mm Stainless Steel tip. Range 0 to 350 Deg C Suitable for most J Type Controllers.